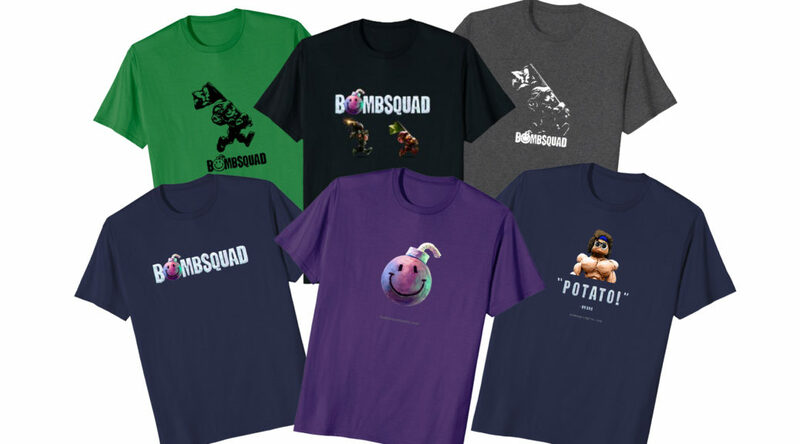 I’ve gotten a lot of requests for this over time (and just thought it would be fun) so I finally put together some BombSquad merch. Its available through Amazon so you get free 2 day shipping with Prime and all that good stuff. Unfortunately its US only at the moment but hopefully the program will expand over time. You know what? You should make a T-Shirt with Grumbledorf saying, “You shall blow up!” Or something along those lines. Consider using redbubble.com for us Europeans. Would be glad wearing a Bombsquad shirt. Besides, they offer all types of merch automatically. TOO BAD. I can’t buy this (now), i live in France. Something that I would personally enjoy to see added would be a third color choice for most of the characters letting us change the skin color. It would allow for even more customization and personalization, which I think is never a bad thing. It would definitely be a small but nice touch. HOLY JESUS, I NEED FAT PIG PLPLPLS!!! Price is too much but then also its so good that i cant stop to buy this… Very nice t-shirts..
Wow! This is surprise for us. THank you. I will buy one soon. So i was wondering how do we mod the game to add new textures and advanced stuff like that? Is there a tutorial? I am new to the world of coding so any help would be appreciated (no spam comments please if you dont know how dont say anything) Thanks in advance.